Cardinal Zen: "I'm Praying The Situation In Hong Kong Won't Become Another Tiananmen"
“Nothing like this has happened in Hong Kong before. I’m just praying that it won’t become like Tiananmen, the situation is similar in many ways. We must pray this does not happen!” This is what Cardinal Joseph Zen Ze-kiun told me by phone from Hong Kong on the evening of October 1. The 82 year-old cardinal had been with the Occupy Central protesters over the weekend and again during these past two days. He had just returned home to rest a little at Braga House, the Salesian residence where he lives, when I spoke to him, but he intended to go out again later in the evening and would be with the pro-democracy non-violent, peaceful protesters tomorrow and as long as the protest lasts. “I’m very worried. The situation is very dangerous,” he told me. “The authorities celebrated the national holiday (China’s national day) today but they don’t seem to realize the seriousness of the situation or how angry the people of Hong Kong are. They seem to have no sense of what has happened in these days. The protesters are peaceful but they are waiting for an answer from the Government, but no wise answer is coming from the authorities. We have to remain united, non-violent and peaceful till the end,” he added. The cardinal said the authorities held the official ceremony of the raising of the flag in Hong Kong today in the presence of the Chief-Executive, as is usual on China’s national day, but some of the student leaders carried out a peaceful protest by turning their backs on the red flag. October 1 and 2 are holidays in Hong Kong and tens of thousands of people from all parts of the city joined the pro-democracy demonstrations, now known as “the umbrella revolution." “Everybody is angry at the authorities, but they protest in a non-violent, peaceful way," Zen said. “The protesters are so peaceful and mild, they do not want violence, they want to make their feelings known in a peaceful way,” the cardinal stated. But he fears agent-provocateurs could infiltrate the movement because this morning the pro-democracy organizers found bricks and iron bars inside an area which they are occupying. Who put them there? The Shanghai-born cardinal spoke at student gatherings during the past week when students in schools and universities across the city boycotted classes in a spontaneous pro-democracy demonstration. Zen explained the Catholic social teaching and the right to peaceful resistance to them. At one stage when the police were treating the students badly, “I gave a small sermon to the police and reminded them that the students are their brothers and sisters,” he said. Early Saturday night/Sunday morning they called him and he joined the Occupy Central protestors in the area in front of the Legislative Building, along with other leaders, among them some Catholics such as former democracy movement leader Martin Lee, and the owner of a leading Hong Kong pro-democracy paper, Apple Daily. Then on Sunday, the cardinal preached at mass in the center of the Occupy Central protest, celebrated by the Italian missionary priest Fr. Franco Mella, who has spent most of his life in Hong Kong. Zen encouraged people to keep this pro-democracy demonstration non-violent and peaceful. He advocated moderation in the slogans too, so as to avoid provoking the authorities in Hong Kong or Beijing, but he said he could understand that people might want to vent their feelings through slogans as they feel cheated. “We decided to occupy the area in front of the Legislative Building as part of our peaceful protest. We expected to be arrested, we wanted to be arrested as this would help raise the consciousness of people here and elsewhere”, he said. There were many reporters and photographers with them to record such a moment, as none of the protest in Hong Kong has been reported by the state controlled media in mainland China. Zen felt sure they were going to be arrested because the police had only allowed a small number of people inside, but when tens of thousands of people gathered outside that area and more continued to arrive and join the protest, the police suddenly attacked the peaceful demonstrators without any provocation. They shot 87 canisters of tear gas and much pepper spray into the unarmed peaceful crowd whose only protection was their umbrellas. The police did not throw teargas inside the occupied area where Zen and the others were, but fumes arrived none the less and so they moved to a higher ground. “That was a huge mistake by the authorities,” the cardinal stated. “They alienated so many people in Hong Kong by acting in such a violent way against peaceful people. The authorities lost dignity and the respect of the people,” he said. As a result of this violent action a great many more people from all across the city joined the pro-democracy protest. The fearless cardinal explained that the protesters want Beijing and the Hong Kong government to keep the promise given at the time of the handover in 1997 to allow universal suffrage to the 7.1 million residents of Hong Kong. The authorities had promised broad consultation before reaching a decision for the 2017 elections but when the pro-democracy movement, in which the cardinal played a significant role, came up with proposals through a public referendum in which 800,000 people voted, some months ago, the Hong Kong authorities totally ignored their input, as did Beijing. Instead, the Hong Kong Government together with Beijing decided on a plan that totally controls who can be a candidate to run in the elections to choose the chief executive. The people of Hong Kong felt badly cheated by this “fake democracy” and so the Occupy Central planned to take action on October 1, but then the student protest movements started spontaneously about ten days ago, and now the two groups have joined forces. The Hong Kong diocese with its 374,000 faithful is behind the call for greater democracy, the cardinal said. Last Monday, after the police attacked the protesters, Cardinal John Tong Hon, who succeeded Zen as bishop of Hong Kong, issued a good statement calling on the government to exercise restraint and to listen to the people, he said. 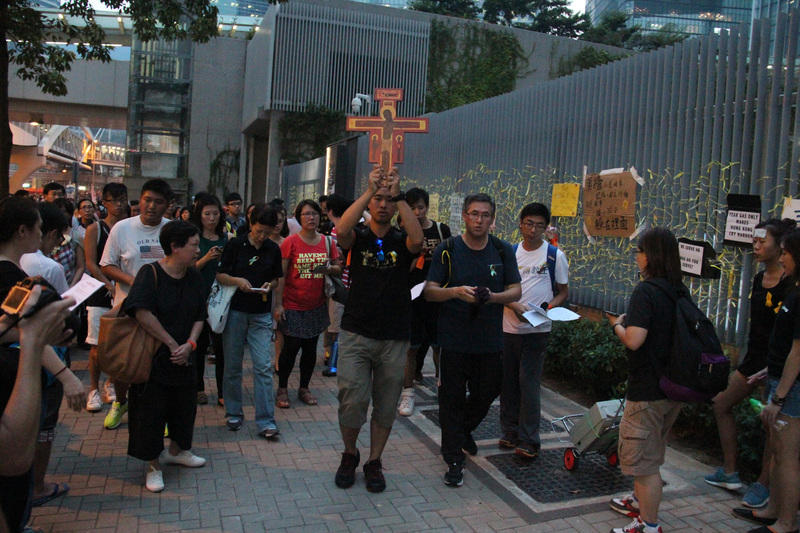 The diocesan Justice and Peace Commission works in close contact with the student movement and with the Occupy Central leaders, and one of the new auxiliary bishops of Hong Kong, Bishop Joseph Ha, a Franciscan, celebrated mass in a crowded cathedral last Monday “to invoke the help of God in the present situation,” the cardinal added.